Four people have been arrested in Gothenburg suspected of plotting terrorism, but police won’t say if it’s linked to the 9/11 anniversary. The Roda Sten arts centre in Gothenburg, which was evacuated overnight. SWEDISH POLICE HAVE arrested four people on suspicion of preparing a terror attack and evacuated an arts center in Sweden’s second largest city on the eve of the 9/11 anniversary. The four were arrested in the west coast city of Gothenburg and were suspected of plotting terrorism, said Sara Kvarnstrom, spokeswoman for the Swedish security police, SAPO. She declined to give details on the arrests and wouldn’t say whether they were linked to the 10-year anniversary of the 11 September terrorist attacks in the United States. Kvarnstrom said SAPO saw no reason to raise its terror alert level, which has been at “elevated” since October. “Our assessment is that there is no reason for public concern at the moment,” she told The Associated Press. 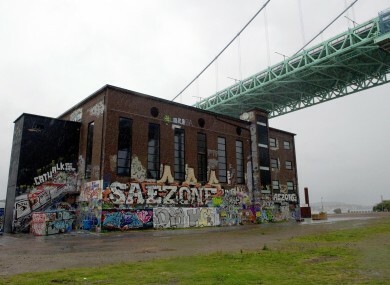 Police in Gothenburg said in a statement they had evacuated an arts center, located beneath Gothenburg’s landmark half-mile Alvsborg bridge. Gothenburg police said they had assisted security police with the arrests, but declined to give any further comments. Kvarnstrom declined to say if the arts center or the bridge were considered as potential targets for a terror attack. Mia Christersdotter Norman, the head of the Roda Sten arts center, said about 400 people were celebrating the opening of an international biennial for contemporary art when police ordered everyone to leave the building. “Around midnight I was called out by the police and they said there was a threat to the building and asked us to quietly stop the party, which we did and everyone left,” Christersdotter Norman told The Associated Press. “Police have searched the building but they didn’t find anything,” she said, adding the arts center would reopen as usual on Sunday. She said she had no information about the arrests, and had not been aware of any threats against the arts festival or its participants before the police operation. In December, suicide bomber Taimour Abdulwahab blew himself up in downtown Stockholm among panicked Christmas shoppers, injuring two people and causing shock in a country that had largely been insulated from terrorism. The 2007 drawing of the Prophet Muhammad by a Swedish cartoonist raised tensions in Sweden. In May, Lars Vilks was assaulted while giving a speech in Uppsala, and vandals unsuccessfully tried to burn down his home in southern Sweden. His cartoon was reportedly the inspiration for Abulwahab’s attack. Vilks was not attending the art biennial in Gothenburg. In a report detailing the extent of extremist Islamist networks in Sweden, ordered months before that attack, the SAPO security agency had downplayed the risk of terror attacks in the Nordic country. Activity among radicalized Muslims in Sweden is primarily directed toward supporting militants in other countries, including Somalia, Afghanistan and Pakistan, it said. Scandinavia has largely been focused on Islamic terrorism since 11 September, but in the wake of Norway’s terrorist attack by a right-wing anti-immigrant Norwegian, the European police agency said it was setting up a task force of more than 50 experts to help investigate non-Islamist threats in Scandinavian countries. Email “Four terror suspects arrested in Sweden, Gothenburg arts centre evacuated”. Feedback on “Four terror suspects arrested in Sweden, Gothenburg arts centre evacuated”.